To Cite: Jakupi X, M. Lunar M, Mlakar J, Matković I, P. Tavakoli N, et al. HCV Infection among Injecting Drug Users in Prishtina, Kosovo, Hepat Mon. 2018 ; 18(10):e80189. doi: 10.5812/hepatmon.80189. Background: Globally, 10 million injecting drug users (IDUs) are estimated to be HCV-positive, resulting in a prevalence of 67%. We evaluated the previously unassessed HCV infection amongst IDUs in Kosovo. We determined the distribution of HCV genotypes among IDUs in Prishtina, ascertained their phylogenetic relatedness, and investigated the main risk factors associated with the HCV infection. Methods: Samples were obtained from 205 IDUs in Prishtina, Kosovo, during the Biological and Behavioral Surveillance Study (BioBSS). HCV-positive samples were further genotyped and sequenced. The results were linked with epidemiological data obtained in interviews determining the underlying causes of HCV transmission. Results: The majority of the 205 IDUs participating in the BioBSS were men (89.3%) with a mean age of 36 years and a history of imprisonment, unemployment, and over a decade of injection drug use. Forty-eight percent of the IDUs were positive for anti-HCV antibodies, and HCV RNA was detected in 70 IDUs (70.7% of the anti-HCV positive IDUs). The following HCV subtypes were detected: subtype 1a (64.3%), subtype 3a (34.3%), and subtype 2k (1.4%). Phylogenetic clustering was evident among 66.7% of the HCV subtype 1a samples and 71.4% of the subtype 3a samples. Significant independent predictors for anti-HCV positivity among IDUs were older age, longer duration of drug use, low education level, drug injection in “shooting galleries”, and imprisonment. Conclusions: In Prishtina, Kosovo, nearly half of the IDUs were determined to be anti-HCV positive and the majority had an active infection. HCV subtype 1a was found to be most prevalent, followed by subtype 3a. Our results emphasize the urgent need for the implementation of harm-reduction programs among IDUs in Kosovo, specifically treatment and prevention through needle/syringe exchange programs directed at gathering places, such as shooting galleries. Hepatitis C virus (HCV) is one of the leading causes of hepatitis, liver cirrhosis, and hepatocellular carcinoma (1, 2). In 2015, 1.0% of the population (71.1 million people worldwide) was estimated to be infected with HCV, indicating a significant disease burden (3). HCV is an RNA virus, classified within the Hepacivirus genus of the Flaviviridae family, with seven genotypes and 67 subtypes characterized thus far (4, 5). HCV genotype 1 is most prevalent worldwide (approximately 46%), followed by genotype 3 (approximately 30%) and genotypes 2, 4, 6, and 5 (6). Substandard health care safety measures and the use of drugs through injection are the leading causes of new HCV infections and accounted for the majority of the 1.75 million new infections in 2015 (7). A midpoint anti-HCV prevalence of 67% was observed among injecting drug users (IDUs) from 77 countries and a 47-fold higher anti-HCV prevalence compared to the general population was noted (8, 9). HCV prevalence among IDUs in the European Union countries ranges from 13.8% in Malta to 84.3% in Portugal (10). The rates in the countries around Kosovo are reported from 28.8% in Albania, 31.2% in Bosnia and Herzegovina, and 53% in Podgorica, Montenegro, to 72.1% in Skopje, Macedonia, and up to 77.4% in Serbia (11-15). Kosovo is a small country (10,908 km2) in southeastern Europe with a population of approximately 1.8 million. Administratively, it is divided into seven regions, with 27.5% of the total population residing in the largest region of Prishtina (16). Currently, data on the HCV prevalence and HCV genotype distribution among the general population, as well as specific risk groups (such as IDUs), in Kosovo are scarce. It was estimated that 4,973 IDUs were present in Kosovo following programmatic mapping and size estimation of key populations conducted in 2016 as part of the HIV program in Kosovo. Of these, 1,217 (24.5%) were from the municipality of Prishtina (17). The aim of our study was to determine the rates of HCV infection among IDUs in Prishtina, Kosovo and for the first time, to investigate the distribution of HCV genotypes/subtypes. In addition, we wished to characterize the factors contributing to HCV transmission and observe epidemiologic links using phylogenetic analyses. These data will aid in the development of appropriate HCV prevention strategies and treatment guidelines for IDUs in Prishtina, Kosovo. Epidemiological data and blood samples from 205 IDUs obtained during the Biological and Behavioral Surveillance Study (BioBSS) in the Prishtina region of Kosovo were included in this investigation. The BioBSS was implemented during 2011 under the auspices of the Ministry of Health and funded by the Global Fund for AIDS, TB, and Malaria (GFATM) using respondent-driven sampling (RDS). The study inclusion criteria were: (a) age between 18 and 50 years, (b) fluency in Albanian, (c) injected drugs at least once in the past month, and (d) residing and/or working in Prishtina (or having injected drugs regularly for at least three months in the past year in Prishtina). Blood samples from IDUs were collected by the staff of the non-governmental organization Labyrinth at their premises in Prishtina. This organization provides methadone substitution therapy and needle/syringe exchange to IDUs in the Prishtina region. All eligible individuals were informed about the nature and requirements of the study and were asked for informed consent. The samples were tested using the HCV Ab Sensitive ELISA test (Dialab, Wiener Neudorf, Austria) for the detection of antibodies against HCV following the manufacturer’s instructions as part of the initial BioBSS. Serum samples that tested anti-HCV positive were included in this study to further explore HCV molecular epidemiology among IDUs in Kosovo. Data obtained from questionnaires were reanalyzed, this time mainly focusing on HCV status; that is, drug-use practices, sexual behavior, imprisonment, and opioid substitution therapy information were reviewed. This study was approved by the Ethics Committee of the Medical Faculty at the Hasan Prishtina University of Prishtina. The presence of HCV RNA was first analyzed using the automated COBAS AmpliPrep/COBAS AMPLICOR HCV test, version 2.0 (Roche Diagnostics, Basel, Switzerland). If determined to be HCV RNA positive, viral RNA was extracted from 200 to 400 µl of plasma using the MagnaPure Compact Nucleic Acid Isolation kit (Roche Diagnostics) on the MagNA Pure Compact instrument (Roche Diagnostics). The HCV genotype was determined by sequencing the core region of the HCV genome. Briefly, PCR was performed using the SuperScriptTM III One-Step RT-PCR System with Platinum® Taq DNA Polymerase High Fidelity (Invitrogen, Carlsbad, CA, USA) and primers Sc2/Ac2, as described previously (18). If no amplicon was obtained, nested PCR with S7/A5 primers (18) and the FastStart High Fidelity PCR System (Roche Diagnostics) were employed. The 441 bp or 355 bp amplicons obtained were purified with the addition of the enzymes Exonuclease I and Shrimp Alkaline Phosphatase (Thermo Fisher Scientific, Waltham, MA, USA) and sequenced using the BigDye® Terminator v3.1 Cycle Sequencing kit (Applied Biosystems, Foster City, CA, USA) by using the S7 primer. The DyeEx 2.0 Spin kit (Qiagen, Hilden, Germany) was used for the removal of unincorporated dye terminators from the sequencing reactions. Sequencing was performed on the 3500 Genetic Analyzer (Applied Biosystems). HCV genotype was determined using the NCBI Genotyping tool (19), with the addition of the genotype reference set 2012 of the core region, retrieved from HCV Sequence Alignments (20). To investigate the molecular epidemiology and transmission routes of HCV, the NS5B region of the viral genome was sequenced as described above. Samples genotyped as subtypes 1a and 3a were further analyzed with primers A1b/F1b for subtype 1a and primers A3a/F3a and B3a/E3a for subtype 3a (21). Separate alignments of the obtained sequences were made using ClustalW, which is available in the BioEdit package (22). A quick neighbor-joining tree was created using Mega 5.05 with 100 bootstrap replicates (23). Major clusters were identified and the most similar sequences to the clustered sequences were selected by employing the HCV BLAST search tool (24-26). Genotype reference set 2014 was retrieved from HCV Sequence Alignments (20). Finally, maximum likelihood phylogenetic trees were constructed using PhyML 3.0 (27) with integrated model selection (Smart Model Selection) according to the Akaike Information Criterion. The phylogeny obtained was viewed using FigTree, v1.4.3, and phylogenetic clusters were identified according to the approximate likelihood ratio test (aLRT) branch support values obtained. The statistical analyses were performed using SPSS software, version 17.0. Data obtained from the questionnaires were analyzed with the focus on factors that could have contributed to HCV infection. Data were expressed as the mean ± standard deviation (SD), median, and inter-quartile range, or frequencies, as appropriate. Differences between subgroups were assessed by χ2 (Chi-square) test, Fisher’s exact test, Student’s t-test, and an analysis of variance test. Different variables were analyzed using Poisson’s multivariate regression analysis with a robust 95% confidence interval, which directly estimates the relative risk (RR). The Wald Chi-square test was used as a test for the model effect to determine the statistical significance of each of the independent variables. A P value of less than 0.05 was considered statistically significant. Among the 205 IDUs included in the study, the majority was men (89.3%), with a mean age of 36.2 years. The age group of 30 - 39 years was most represented (50.7%) (Table 1). During the three months prior to the interview, the majority of the IDUs lived in their own houses/apartments (42.5%) or lived with their parents (32.5%). Four subjects that responded were in prison at that time. The largest proportion of IDUs (39%) was financially supported by their family, approximately one-third (29.8%) was permanently employed, and approximately 9% had no income during the month prior to the interview. Of the total 205 IDUs participating in the study, 99 (48.3%) were anti-HCV positive. Anti-HCV positivity was significantly associated with age, marital status, and level of education (P = 0.001, P = 0.048, and P = 0.001 - 0.030). A significant association was observed between the duration and frequency of injection drug use and anti-HCV positivity (Table 1). All 10 addicts that reported drug injection four or more times per day were anti-HCV positive. The lowest HCV prevalence was noted among IDUs that injected drugs only once, or two to three times per month (31.3% and 27.8%, respectively). IDUs that injected drugs at “shooting galleries” or similar social settings were more likely to be anti-HCV positive and had a three-fold greater risk of anti-HCV positivity compared to IDUs injecting at home (Table 1). Abbreviations: CI, confidence interval; OR, odds ratio. a*P < 0.05, **P < 0.01, *** Unable to calculate. A statistically significant association was observed between anti-HCV positivity and the concomitant use of heroin and cocaine, morphine, and methadone (Table 1). There was no significant difference between anti-HCV positive and negative individuals regarding injection with the use of secondhand needles and syringes, use of sterile needles/syringes, the frequency of using sterile needles/syringes, and the method by which needles were cleaned. The anti-HCV positive drug addicts more regularly obtained sterile syringes/needles from nongovernmental organizations than the anti-HCV negative IDUs (58.8% vs. 41.2%; P < 0.001). Over half of the IDUs included had been arrested for drug use or had been imprisoned in the past, and a significantly higher number of those were anti-HCV positive (Table 1). However, there was no significant association between anti-HCV positivity and injection of drugs while in prison (data not shown). Multivariate logistic regression analysis indicated the following factors were significantly associated with HCV infection among IDUs: (1) older age (P = 0.009), (2) low education level (P = 0.039), (3) longer duration of drug use (P = 0.002), (4) drug injection at shooting galleries (P = 0.001), and (5) imprisonment (P = 0.010). HCV RNA was detected in 70/99 (70.7%) anti-HCV positive IDUs from Prishtina. HCV genotyping was successfully performed for all HCV RNA positive IDUs, and the following subtypes were identified: subtype 1a in 45 patients (64.3%), subtype 3a in 24 patients (34.3%), and subtype 2k in one patient (1.4%). NS5B sequences were successfully obtained for 39/45 of IDUs with HCV subtype 1a and for 21/24 IDUs with HCV subtype 3a. 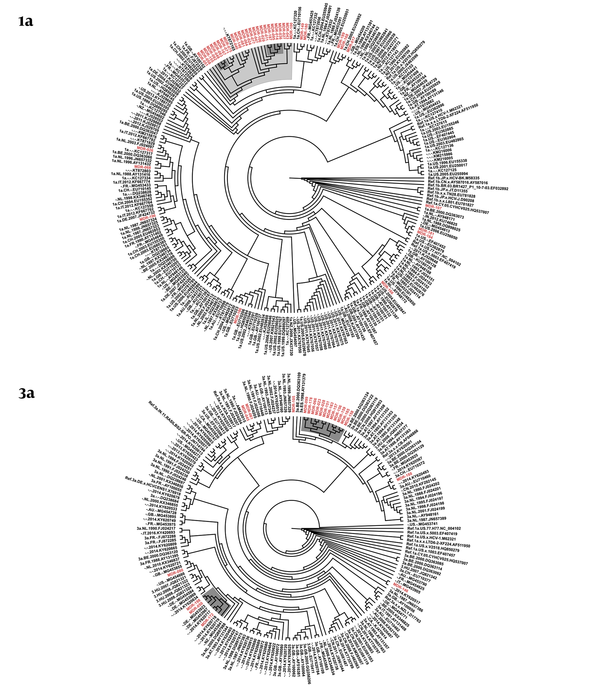 The phylogenetic tree of HCV subtype 1a from Prishtina IDUs displayed two phylogenetic clusters with aLRT > 0.9, one with five sequences, and another with three sequences. These two clusters were part of a larger cluster with aLRT > 0.8, encompassing sequences obtained from a total of 26 IDUs. Thus, 66.7% (26/39) of the HCV subtype 1a IDUs’ samples were observed with a phylogenetic link. In addition, two transmission pairs of IDUs were seen on this cladogram (Figure 1). Figure 1. 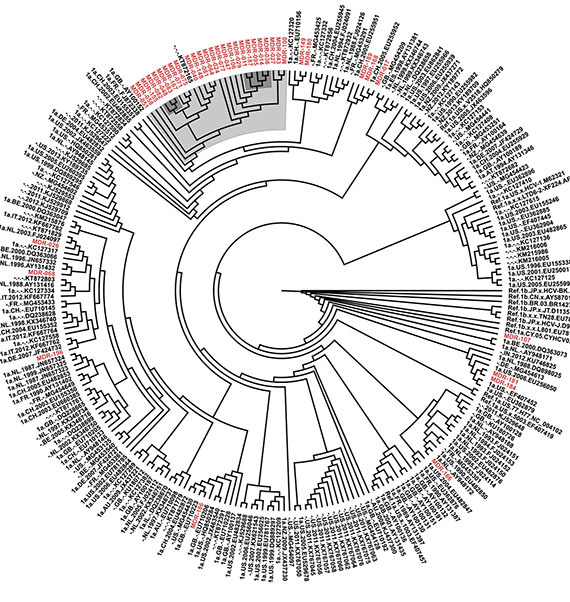 The maximum likelihood phylogenetic trees of HCV subtype 1a and 3a. Sequences from IDUs from Kosovo (named MDR) are red, and control and reference sequences are black. Clusters with aLRT > 0.9 are highlighted in dark gray and clusters with aLRT > 0.8 are highlighted in light gray. The phylogenetic tree of HCV subtype 3a showed one large cluster with aLRT > 0.9, encompassing 12 sequences, another cluster with aLRT > 0.9 with three sequences from Kosovo, and one transmission pair. In total, 71.4% (15/21) of the HCV subtype 3a samples obtained from Prishtina IDUs showed phylogenetic clustering (Figure 1). Nearly half of the IDUs in the Prishtina region of Kosovo had antibodies against HCV, mainly due to active HCV infection. HCV subtype 1a was found to be most prevalent, followed by subtype 3a. In addition, this study found a high proportion of sampled individuals with a phylogenetic link to one another. HCV prevalence has historically been high among IDUs, as observed in Kosovo and the surrounding countries (11-15). The problem of HCV infection among IDUs is pronounced in eastern and southeastern Europe, where the rate of injecting drug use is almost five times higher than the global average (28). Subtypes 1a and 3a have been determined to be the most prevalent subtypes among IDUs in several studies (29, 30), as seen in this study. High phylogenetic clustering of the subtype 1a and 3a sequences was observed in this investigation, indicating HCV transmission within the community of IDUs residing and injecting drugs in Prishtina. It should be noted, however, that the participants in this study were selected by respondent-driven sampling (RDS), which could have contributed to the observed phylogenetic clustering. Several factors were identified to be significantly associated with HCV infection among IDUs from Prishtina in this study; namely, older age, low education, imprisonment, and injecting drugs at shooting galleries. These factors have already been identified in other similar studies to be related to HCV transmission among IDUs (31, 32). Older IDUs were more often diagnosed with HCV infection, probably resulting from a longer duration of drug use, determined as another significant predictor for HCV infection. In addition, individuals with poor education have limited opportunities for employment in Kosovo, where the unemployment rate is high even in the general population. The issue of imprisonment and HCV infection in Kosovo requires additional investigation. The extent of drug use and the prevalence of HCV infection in prisons, as well as whether the imprisonment of IDUs is mainly due to drug-related charges, should be determined. An important finding from this study is the relevance of shooting galleries on HCV infection among IDUs in Prishtina, as seen in other previously published studies (33, 34). This type of venue is associated with an increased risk of HCV acquisition, either via socializing with an extended group of IDUs or via the intentional or accidental use of secondhand injecting equipment. Sharing drug-injecting equipment is linked with the social and economic situation of the user and it contributes to HCV transmission among IDUs (35). In addition to infection via contaminated needles, HCV transmission can also occur through contact with the infected liquid in syringes and inanimate surfaces, as under certain conditions, the virus can remain infective for weeks (36, 37). The results from this study show that almost all IDUs report that they use sterile needles/syringes for drug injection, but at the same time, the majority of IDUs report that somebody else also used their needles/syringes. This could imply that the study inadvertently omitted the majority of IDUs that are injecting drugs with used needles/syringes or it could indicate misreporting of sharing needles/syringes. The latter is more likely because most study participants used harm-reduction services from the Labyrinth NGO. The same staff instructed IDUs not to share used needles/syringes and conducted the interviews reported in this study. Almost all IDUs reported that they purchased sterile needles/syringes from pharmacies, whereas anti-HCV positive IDUs received sterile needles significantly more often from NGOs compared to anti-HCV negative IDUs. Considering the high unemployment rate among IDUs, purchasing sterile needles/syringes is challenging. Thus, a needle/syringe exchange program implemented through organizations working on harm reduction is of utmost importance and, together with opioid substitution treatment (OST), is the key to the prevention and control of infectious diseases among IDUs. Unfortunately, the harm-reduction program for IDUs in Kosovo is limited in its experience and scope of coverage (38). Therefore, additional resources and staff should be allocated to the already existing harm-reduction programs in Prishtina to enhance their scope of coverage and to improve their quality. Shooting galleries were shown to contribute significantly to the spread of HCV infection and should thus be prioritized for intervention. An emphasis should be placed on preventing HCV infection among younger IDUs because they have a lower rate of HCV infection compared to older groups, presenting a window of opportunity. In addition, treatment, as well as prevention, should be directed at IDUs with an active HCV infection to limit further spread of HCV in Kosovo. We are grateful to Aleksandar Stulhofer, Department of Sociology, University of Zagreb, Croatia, for the preparation of BioBSS tools, to staff of the NGO Labyrinth, headed by Safet Blakaj, for conducting interviews with IDUs, and to all staff of the National Institute of Public Health of Kosovo and Institute of Microbiology and Immunology, Faculty of Medicine, University of Ljubljana who were involved in the study implementation. Authors' Contribution: Study concept and design: Xhevat Jakupi, Mario Poljak, and Adriana Vince; analysis and interpretation of data: Xhevat Jakupi, Maja M. Lunar, Jana Mlakar, Ivana Matković, and Beti Zafirova Ivanovska; drafting of the manuscript: Xhevat Jakupi, Maja M. Lunar, Jana Mlakar, and Norma P. Tavakoli; critical revision of the manuscript for important intellectual content: Mario Poljak and Adriana Vince; statistical analysis: Xhevat Jakupi and Beti Zafirova Ivanovska. Conflict of Interests: Authors declare that there are no conflict of interest in this study. Funding/Support: The BioBSS was implemented under the auspices of the Ministry of Health and funded by the Global Fund for AIDS, TB, and Malaria (GFATM) project (Scaling up HIV Prevention in Kosovo; Grant no. KOS-711-G04-H). Ethical Considerations: All eligible individuals were informed about the nature and requirements of the study and were asked for informed consent. This study was approved by the Ethics Committee of the Medical Faculty at the Hasan Prishtina University of Prishtina (No.4489; dated October 9, 2012). 1. Choo QL, Kuo G, Weiner AJ, Overby LR, Bradley DW, Houghton M. Isolation of a cDNA clone derived from a blood-borne non-A, non-B viral hepatitis genome. Science. 1989;244(4902):359-62. [PubMed: 2523562]. 2. Alter MJ. Epidemiology of hepatitis C virus infection. World J Gastroenterol. 2007;13(17):2436-41. [PubMed: 17552026]. [PubMed Central: PMC4146761]. 3. Blach S, Zeuzem S, Manns M, Altraf I, Dubrog AS, Muljono DH, et al. Global prevalence and genotype distribution of hepatitis C virus infection in 2015: a modelling study. Lancet Gastroenterol Hepatol. 2017;2(3):161-76. doi: 10.1016/S2468-1253(16)30181-9. [PubMed: 28404132]. 4. Simmonds P, Becher P, Bukh J, Gould EA, Meyers G, Monath T, et al. ICTV virus taxonomy profile: flaviviridae. J Gen Virol. 2017;98(1):2-3. doi: 10.1099/jgv.0.000672. [PubMed: 28218572]. [PubMed Central: PMC5370391]. 5. Murphy DG, Sablon E, Chamberland J, Fournier E, Dandavino R, Tremblay CL. Hepatitis C virus genotype 7, a new genotype originating from central Africa. J Clin Microbiol. 2015;53(3):967-72. doi: 10.1128/JCM.02831-14. [PubMed: 25520447]. [PubMed Central: PMC4390628]. 6. Messina JP, Humphreys I, Flaxman A, Brown A, Cooke GS, Pybus OG, et al. Global distribution and prevalence of hepatitis C virus genotypes. Hepatology. 2015;61(1):77-87. doi: 10.1002/hep.27259. [PubMed: 25069599]. [PubMed Central: PMC4303918]. 7. WHO. Global hepatitis report 2017. Geneva: World Health Organization. 2017, [cited May 2018]. Available from: http://www.who.int/hepatitis/publications/global-hepatitis-report2017/en/. 8. Nelson PK, Mathers BM, Cowie B, Hagan H, Des Jarlais D, Horyniak D, et al. Global epidemiology of hepatitis B and hepatitis C in people who inject drugs: results of systematic reviews. Lancet. 2011;378(9791):571-83. doi: 10.1016/S0140-6736(11)61097-0. [PubMed: 21802134]. [PubMed Central: PMC3285467]. 9. Hahne SJ, Veldhuijzen IK, Wiessing L, Lim TA, Salminen M, Laar M. Infection with hepatitis B and C virus in Europe: a systematic review of prevalence and cost-effectiveness of screening. BMC Infect Dis. 2013;13:181. doi: 10.1186/1471-2334-13-181. [PubMed: 23597411]. [PubMed Central: PMC3716892]. 10. ECDC. Systematic review on hepatitis B and C prevalence in the EU/EEA. Stockholm: European Centre for Disease Prevention and Control. 2016, [cited May 2018]. Available from: https://ecdc.europa.eu/sites/portal/files/media/en/publications/Publications/systematic-review-hepatitis-B-C-prevalence.pdf. 11. Institute of Public Health. Albania Behavioural and Biological Surveillance Study (Bio-BSS) Report; "third round.". Tirana: Institute of Public Health; 2011. 12. Institute for Public Health FB and H. A respondent-driven sampling survey—behavioral and biological surveillance study among injection drug users in Bosnia and Herzegovina. Sarajevo; 2012. 13. Lausevic D, Begic S, Mugosa B, Terzic N, Vratnica Z, Labovic I, et al. Prevalence of HIV and other infections and correlates of needle and syringe sharing among people who inject drugs in Podgorica, Montenegro: a respondent-driven sampling survey. Harm Reduct J. 2015;12:2. doi: 10.1186/s12954-015-0039-0. [PubMed: 25884194]. [PubMed Central: PMC4367921]. 14. Institute of Public Health of Republic of Macedonia. Report on the bio-behavioral study among people who inject drugs in Macedonia, 2014. Skopje: Ministry of Health of Republic of Macedonia; 2014. 15. EMCDDA. Serbia country overview. Lisbon: European Monitoring Center for Drugs and Drug Addiction. 2015, [cited October 2017]. Available from: http://www.emcdda.europa.eu/countries/serbia. 16. KAS. Kosovo census atlas. Pristina, Kosovo Agency of Statistics. 2013, [cited October 2017]. Available from: http://ask.rks-gov.net/media/2009/kosovo-census-atlas-2011.pdf. 17. National Institute of Public Health of Kosovo. Programmatic mapping and size estimations of key populations in Kosovo. 2016, [cited October 2017]. Available from: http://ghdx.healthdata.org/geography/kosovo. 18. Ohno O, Mizokami M, Wu RR, Saleh MG, Ohba K, Orito E, et al. New hepatitis C virus (HCV) genotyping system that allows for identification of HCV genotypes 1a, 1b, 2a, 2b, 3a, 3b, 4, 5a, and 6a. J Clin Microbiol. 1997;35(1):201-7. [PubMed: 8968908]. [PubMed Central: PMC229539]. 19. Rozanov M, Plikat U, Chappey C, Kochergin A, Tatusova T. A web-based genotyping resource for viral sequences. Nucleic Acids Res. 2004;32(Web Server issue):W654-9. doi: 10.1093/nar/gkh419. [PubMed: 15215470]. [PubMed Central: PMC441557]. 20. HCV Sequence Alignments. Sequence alignments - Los Alamos HCV database. 2018. Available from: http://hcv.lanl.gov/content/sequence/NEWALIGN/align.html. 21. van Asten L, Verhaest I, Lamzira S, Hernandez-Aguado I, Zangerle R, Boufassa F, et al. European and Italian seroconverter studies. Spread of hepatitis C virus among European injection drug users infected with HIV: a phylogenetic analysis. J Infect Dis. 2004;189(2):292-302. doi: 10.1086/380821. [PubMed: 14722895]. 22. Hall T. BioEdit: a user-friendly biological sequence alignment editor and analysis program for Windows 95/98/NT. Nucl Acids Symp Ser. 1999;41:95–8. 23. Tamura K, Peterson D, Peterson N, Stecher G, Nei M, Kumar S. MEGA5: molecular evolutionary genetics analysis using maximum likelihood, evolutionary distance, and maximum parsimony methods. Mol Biol Evol. 2011;28(10):2731-9. doi: 10.1093/molbev/msr121. [PubMed: 21546353]. [PubMed Central: PMC3203626]. 24. Altschul SF, Madden TL, Schaffer AA, Zhang J, Zhang Z, Miller W, et al. Gapped BLAST and PSI-BLAST: a new generation of protein database search programs. Nucleic Acids Res. 1997;25(17):3389-402. [PubMed: 9254694]. [PubMed Central: PMC146917]. 25. Karlin S, Altschul SF. Methods for assessing the statistical significance of molecular sequence features by using general scoring schemes. Proc Natl Acad Sci U S A. 1990;87(6):2264-8. [PubMed: 2315319]. [PubMed Central: PMC53667]. 26. Karlin S, Altschul SF. Applications and statistics for multiple high-scoring segments in molecular sequences. Proc Natl Acad Sci U S A. 1993;90(12):5873-7. [PubMed: 8390686]. [PubMed Central: PMC46825]. 27. Guindon S, Dufayard JF, Lefort V, Anisimova M, Hordijk W, Gascuel O. New algorithms and methods to estimate maximum-likelihood phylogenies: assessing the performance of PhyML 3.0. Syst Biol. 2010;59(3):307-21. doi: 10.1093/sysbio/syq010. [PubMed: 20525638]. 28. United Nations Office on Drugs and Crime. World drug report 2014. New York: United Nations Publications. 2014, [cited October 2017]. Available from: http://www.unodc.org/documents/wdr2014/World_Drug_Report_2014_web.pdf. 29. Hysaj-Vila B, Shundi L, Basho M, Ali E, Abazaj E, Bino S, et al. Distribution of hepatitis C virus genotypes among injecting drug users in Albania. Alban Med J. 2014;4:73-6. 30. Treso B, Takacs M, Dencs A, Dudas M, Par A, Rusvai E. Molecular epidemiology of hepatitis C virus genotypes and subtypes among injecting drug users in Hungary. Euro Surveill. 2013;18(47). pii: 20639. [PubMed: 24300886]. 31. Alavi SM, Behdad F. Seroprevalence study of hepatitis C and hepatitis B virus among hospitalized intravenous drug users in Ahvaz, Iran (2002-2006). Hepat Mon. 2010;10(2):101-4. [PubMed: 22312381]. [PubMed Central: PMC3270351]. 32. Backmund M, Meyer K, Wachtler M, Eichenlaub D. Hepatitis C virus infection in injection drug users in Bavaria: risk factors for seropositivity. Eur J Epidemiol. 2003;18(6):563-8. [PubMed: 12908723]. 33. Wylie JL, Shah L, Jolly AM. Demographic, risk behaviour and personal network variables associated with prevalent hepatitis C, hepatitis B, and HIV infection in injection drug users in Winnipeg, Canada. BMC Public Health. 2006;6:229. doi: 10.1186/1471-2458-6-229. [PubMed: 16970811]. [PubMed Central: PMC1586015]. 34. De P, Cox J, Boivin JF, Platt RW, Jolly AM. The importance of social networks in their association to drug equipment sharing among injection drug users: a review. Addiction. 2007;102(11):1730-9. doi: 10.1111/j.1360-0443.2007.01936.x. [PubMed: 17935581]. 35. Brewer DD, Hagan H, Sullivan DG, Muth SQ, Hough ES, Feuerborn NA, et al. Social structural and behavioral underpinnings of hyperendemic hepatitis C virus transmission in drug injectors. J Infect Dis. 2006;194(6):764-72. doi: 10.1086/505585. [PubMed: 16941342]. 36. Paintsil E, He H, Peters C, Lindenbach BD, Heimer R. Survival of hepatitis C virus in syringes: implication for transmission among injection drug users. J Infect Dis. 2010;202(7):984-90. doi: 10.1086/656212. [PubMed: 20726768]. [PubMed Central: PMC2932767]. 37. Doerrbecker J, Friesland M, Ciesek S, Erichsen TJ, Mateu-Gelabert P, Steinmann J, et al. Inactivation and survival of hepatitis C virus on inanimate surfaces. J Infect Dis. 2011;204(12):1830-8. doi: 10.1093/infdis/jir535. [PubMed: 22013220]. [PubMed Central: PMC3247810]. 38. EMCDDA. National report 2014: Kosovo. Lisbon: European Monitoring Centre for Drugs and Drug Addiction. 2014, [cited October 2017]. Available from: http://www.emcdda.europa.eu/countries/kosovo.